Bad Hebrew Tattoos: Spiritual or Gangster? I think the Dalet looks like a dalet, not a resh. It's still a stupid tat, but there you go. In a font with that hey, the other letter is a resh. You guys really should write a name, any name, just so people can differentiate between all the anons. Anyway, my reasoning is the same as Anon #3, He and Resh usually have the same curve, and in any case, the sticking-out part of Dalet should be much more pronounced that that of a He. it definitely looks like a resh to me, the first thing i read was 'Yarah' and not 'Yadah'. It is ok, i met someone who had 'supermarket' tattooed on their leg in Chinese. They thought it said 'freedom'. That will teach her to ask her local takeaway for advice! It's all OK. Half the Christian true-believers will read 'Hari', the other half, 'Hadi'. And both will say 'Awesome!' 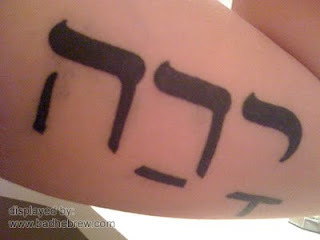 The tattoo needs only a 'Bet' to be turned into 'Birah' (beer). Jesus would approve, having done a bit of 'Ma'im' to 'Yayin' Himself. Another sign of non-professional work: the Nikud is under the middle of the Resh, not under the "leg". Try it with any of the Guttmann fonts, and compare to Microsoft's standard fonts. Most Hebrew speakers wouldn't mind, but those who read plenty of printed text with Nikud (e.g. poetry books, modern bible etc.) would notice it immediately. By the way, both letters should have a Qamatz. See 1 Samuel 20:36. Ok, I understand that the picture of the tattoo is wrong. But you didn't show the correction for this one, just that the dalet isn't the same as the resh. What is the corrected Hebrew for yadah? First, that is a dalet. Not the best font, but it is dalet. And, the problem is dictionary work, but he had the right root, wrong binyan. In classical Hebrew, the hiphil or hitpael of ידה means to give thanks, but in the sense of worship/praise. So, wrong binyan, but not entirely the wrong word.